So I've been learning about the scales (major, minor etc) and how all the scale degrees are related to the major scale. So in a minor scale, if you saw m3 it would mean a flattened 3rd degree in relation to the major scale defined semitones. 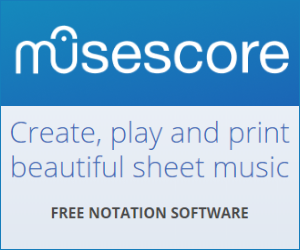 That all seems fine, but I noticed that there's a degree notation using roman numerals and even with the major scale it suggests that some of the degrees are actually minor? so to recap: a chord is typically built from thirds of the scale. The quality of the chord associated with a melodic degree is determined by these thirds. So I counted the semitones between the thirds and found the quality (minor/major) matched the harmonic degrees indicated by the roman numerals. But what I don't understand is why the 7th is 'diminished' and not minor? As the semitones between the 7th degree and the degree a 3rd way from it (which would be a 2nd/9th) is 3 semitones; suggesting a minor third. Ps, what's the correct terminology to use above where I've labelled it 'QUALITY' and 'ROMAN QUALITY'? When talking about the basic triads, aka I ii iii IV V vi viio, we use the formula (1-3-5), and see that from the 1st, 4th and 5th scale degrees we get a major triad, from the 2nd, 3rd and 6th we get a minor triad and from the 7th scale degree we get a diminished triad. It is important to note that the chords come from scale degrees, not the other way round - so the scale degrees aren't "minor", just the chords built from them. A few more minor details (Pun not intended) - altered (not in the major scale) scale degrees are written with b and #, and the triads built from the scale degrees are upper case if major, lower case if minor, lower case with an o to the top right if diminished and upper case with a large + to the right if augmented. The basic chords (Major, minor, diminished, augmented...) are built by stacking thirds (this is called tetrian harmony) on top of eachother, of course being in the scale. By third we mean not the interval of either a M/m third, but x degree +2 (1->3, 2->4), which could result in diminished thirds (#2-4), augmented thirds (b2-#4) and double (and even triple) aug/dim intervals. So the major chord is built by a stack of M3-m3, the minor is mM, the diminished being mm and augmented MM. So when stacking the thirds from the 7th scale degree, we get 7-2-4, which is mm, thus a diminished triad. The correct terminology is: Quality->Interval from 1 (in a single octave), which is useless and shouldn't be in such a table (also, the B above the A which you called P8 is called M9, not M2, as it is a M2 an octave up), and Roman Quality->Chord, which could be better described as the full 7 note chord (7th chord with extensions) - Imaj7(9,11,13) iim7(9,11,13) iiim7(b9,11,b13) IVmaj7(9,#11,13) V7(9,11,13) vim7(9,11,b13) and viim7b5(b9,11,b13). Watch that you don't start confusing melodic degrees with harmonic degrees. The chords built on those degrees are major or minor or diminished, so the Roman numeral reflects that - it is not major or minor relative to the tonic, but to the root of the chord on that degree as created by using notes from that scale. In major, your melodic degrees are set relative to the tonic, and they are 1 through 7 (8 if you include the octave, but that is usually just considered a transposition of 1). So to ascertain the chord with 3 as the root, you build the chord by choosing 3, 5 and 7 (piling up thirds, yes?). The distance between 3 and 5 is a semitone plus a whole tone = a minor third, hence the chord is minor, so the harmonic degree on 3 is iii, i.e., a minor chord. 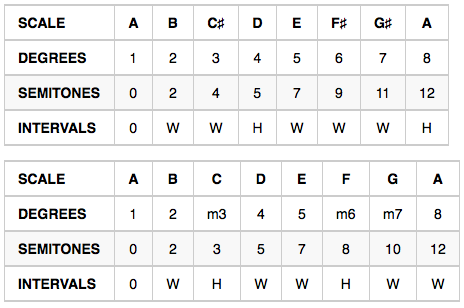 In minor, your melodic degrees are 1, 2, ♭3, 4, 5, ♭6 and ♭7 (with ♭6 and ♭7 often being raised to 6 and 7 in practice). This is the more usual notation in the classical world, and it says that 3, 6 & 7 are flatted by comparison to the major scale. So, the chord on ♭3 would be created from ♭3, 5 & ♭7. ♭3 to 5 is two whole tones, i.e., a major third, hence the chord on ♭3 is ♭III, which signifies that it's a major chord. When you play in a key (A major in your example) the basic chords of the key are built using the notes of the scale. From each starting point you take the note that 2 steps higher as the third and the note that's two steps above that as the fifth. The result is that some chords are major (Tonic (A), Subdominant (D) and Dominant (E)), some are minor (supertonic (B), mediant (C#) and submediant (F#)) and the chord on the leading note (G#) is diminished. Of course there are no rules about having to use these chords. That just how the theory works in describing the scale and the chords obtained from it. Not the answer you're looking for? Browse other questions tagged theory chords scales chord-theory or ask your own question.